Select the single cell or range of cells that you want to name. When typing the range name, you must follow Excel’s naming conventions: Refer to the bulleted list of cell-name do’s and don’ts earlier in this section for details. You can also accomplish the same thing by selecting Home→Find & Select (with the binoculars icon)→ Go To or by pressing F5 or Ctrl+G to open the Go To dialog box (see the figure). 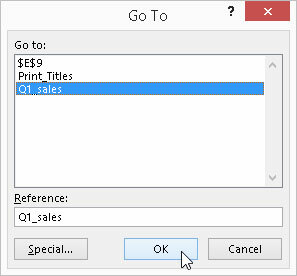 Double-click the desired range name in the Go To list box (alternatively, select the name followed by OK). Excel moves the cell cursor directly to the named cell. If you select a cell range, all the cells in that range are selected as well. Select the named cell range to go to in a workbook.